The first operation is the determination of the chemical-physical properties: the melting point of the solid compounds, the boiling point of the liquid compounds. The qualitative research of the elements follows, trying to discover if, in addition to carbon and hydrogen, there are other elements such as nitrogen, sulfur, halogens, etc. From the observation of how a substance burns, preliminary information on the characteristics can be obtained. Solubility test: Polar compounds dissolve in polar solvents and non-polar compounds dissolve in non-polar solvents. To recognize the presence of nitrogen, sulfur and halogens, we use the Lassaigne method. Sulfur can be detected with acetic acid and lead acetate solution. The analysis of organic substances is different from the inorganic substances analysis. Usually, it is necessary to recognize an already known compound or to characterize a new compound. Although the compounds are very numerous, they can be grouped into a rather limited number of homologous series. The identification of the series to which the compound belongs, makes it easier to recognize the compound itself. In general, the first operation is the determination of the chemical-physical properties: the melting point of the solid compounds, the boiling point of the liquid compounds. The qualitative research of the elements follows, trying to discover if in addition to carbon and hydrogen, there are other elements such as nitrogen, sulfur, halogens, etc. There are several chemical test that are useful, after these, high resolution mass spectrometry can be used to identify the mass and bonding positions. IR spectroscopy can be used to confirm the functional groups and other bonding modes through “fingerprinting”. From the observation of how a substance burns, preliminary information on its characteristics can be obtained. Usually a small amount of substance is placed on a shard of porcelain and is exposed to the flame of a Bunsen at increasing temperatures. The substance burns giving a sooty flame: aromatic compounds. The substance burns giving a non-sooty yellow flame: aliphatic compounds with a low percentage of carbon. The substance is not flammable: it contains halogens or metals. If the compound carbonizes it can be a carbohydrate (smell of burnt sugar), tartaric acid and its salts, citric acid and its salts, uric acid. If the substance carbonises without melting it can be boric acid, starch, sulfonic acid. Polar compounds dissolve in polar solvents and nonpolar compounds dissolve in nonpolar solvents. The solubility measurements are made at room temperature with 1 drop of unknown compound if it is liquid or with 5 mg if it is solid and 0.2 mL of solvent. If it is necessary to determine the presence of such elements in a certain amount of substance, we can mix it with the copper oxide in a test tube and we heat it. Carbon is oxidized to carbon dioxide which forms a white precipitate, BaCO3, in a barite water solution. The hydrogen is recognized by heating the substance with sodium sulfite with the formation of hydrogen sulfide, recognizable by its characteristic odor. To recognize the presence of nitrogen, sulfur and halogens, we use the Lassaigne method. This essay allows us to understand the elementary composition of the molecule. The presence in the nitrogen molecule, halogens, sulfur, arsenic and phosphorus (N, X, S, As, P) can be determined through a thermal reduction with metallic Na. The essay is based on the destruction of the substance in the presence of metallic Na. consequently, the mineralization of the different elements is obtained, which then are transformed into the corresponding sodium salts. 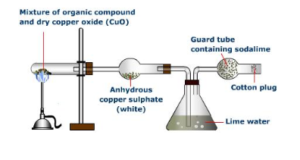 In the reaction the nitrogen is transformed into cyanide, the sulfur is transformed into sulfide, the halogens are transformed into the sodium halide parameters. The anions thus formed can be considered by qualitative inorganic analysis. The presence of oxygen is deduced from the quantitative analysis by calculating the percentage after the examination of all the other elements present in the substance. To find the phosphorus, the substance can be oxidized with fuming nitric acid in order to obtain phosphoric acid which can be detected by the reaction of the molybdate. A small quantity of the sodium extract is taken in a test tube. It is made alkaline by adding 2-3 drops of sodium hydroxide (NaOH) solution. 1 mL of freshly prepared solution of ferrous sulphate is added to this solution. The mixture of the two solutions is boiled and then acidified with dilute sulphuric acid. The appearance of prussian blue or green colouration of the precipitate confirms the presence of nitrogen in the given organic compound. The carbon and nitrogen present in the organic compound on fusion with sodium metal give sodium cyanide (NaCN) soluble in water. So, the sodium extract contains sodium cyanide which, on reaction with ferrous sulphate, gives sodium ferrocyanide. Some of the ferrous salt is oxidised to the ferric salt on heating and this reacts with sodium ferrocyanide to form ferric ferrocyanide. A small portion of sodium extract is acidified with acetic acid and lead acetate solution is added to it. A black precipitate of lead sulphide indicates the presence of sulphur.